Drain Wig Review – a perfect solution for hair in the drain. It doesn’t matter whether you rent your home or own it, you have to keep the plumbing working and in good condition.When it comes to the shower and bathtub drains these can get clogged very easily. There may be a simple little gadget called the Drain Wig that can save you a lot of drain problems. One of the worst cleaning jobs in the bathroom is having to free up the shower or bathtub drain from hair. This is something that just can’t be avoided as everyone suffers from a certain amount of hair loss, and this often occurs during showering. As a result that hair ends up going down the drain. Eventually enough of it accumulates and the drain starts to become sluggish. Before you know it you are standing in a few inches of water every time you take a shower. The Drain Wig is a simple solution. It is a simple small device that you insert into the drain. It is comprised of tiny whiskers that catch the hair as it flows into the drain. Then all you have to do is remove the Drain Wig every few months and replace it with a new one. 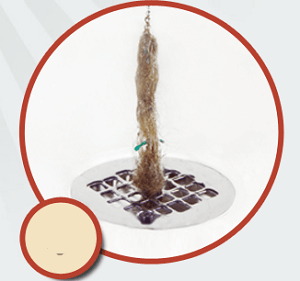 the Company claims that the Drain Wig is universal and will fit most drains. They state that it only takes a few seconds to install it. Another feature that they are promoting is that it is the hygienic way to tackle this problem, as you don’t even come in contact with the hair when you are removing the Drain Wig for disposal. The hype really focuses around the fact that you can easily solve this hair in the drain problem. It means no more having to use some type of utensil to get into the drain and hook the hair to pull it out. If you have ever had to perform this task then you know just how nasty it can be. There are several different offers that are currently being promoted. There is a package of four shower drain wig hair catchers. Or there is a package of 2 shower drain and 2 bathtub drain wig hair catchers. Then finally there is a package of 4 bathtub drain wig hair catchers. If you buy two packages then you get two free at a total cost of $19.95 which includes the shipping. Your commitment is going to be far less than if you had to clean out the hair from the drain manually. All you are going to have to remember to do is to replace the Drain Wig as needed. The frequency for this is going to depend on how many people are using the shower and how badly the hair accumulates. Although this may appear as a new product it has been offered on Amazon for some time. As a result it has gained a fair number of reviews. Out of 180 reviews it is receiving a four start rating. When you consider how often you may have to change the Drain Wig the price is quite reasonable. We’re going to give the Drain Wig a Thumbs Up rating. There are several things that it impresses us with. First we recognize that it really does address a problem that many people have. It is easy to install and doesn’t impede the functioning of the drain. Then being able to just discard it and replace it with a new one is really convenient. While the Drain Wig acts as a preventative in respect to your shower or bathtub drains really getting clogged up, there can be other reasons why this can happen. There are also other solutions for this particular problem which we have talked about and is getting good reviews which is the Turbo Snake. What do you think? Does the Drain Wig work or not? Does the Drain Strain Really Work? Does the Compac's Magic Stone Grill Cleaner Scrub Really Work?